Vitamin D with pure plant power. Vegan! Biobene vitamin D vegan is a dietary supplement, developed by experts. 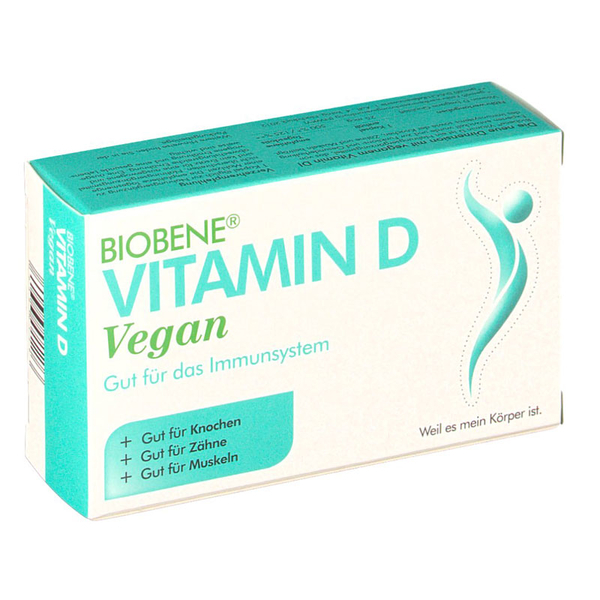 This product contains a purely vegetable source of vitamin D (ergocalciferol) from sugar cane and is thus especially suitable for vegetarians and vegans and diabetics. Consume 2 capsules daily as a dietary supplement with a glass of liquid closest to or after a fatty meal over a period of at least 3 months. Is suitable for diabetics! 50 mcg Vitamin D2 (vegetable) = 2.000 I.U. Free of sugar, lactose, fructose, gluten, iodine, milk derivatives, yeast, preservatives and dye.